Apologies in advance for the poor quality of the graphics. That will be addressed as soon as we can fix the issue. On Thursday 9th February, Mr Paul Fletcher MHR, the Federal Minister for Infrastructure, had an extensive opinion piece published by The West Australian, in which he criticised those who oppose the Perth Freight Link, as put forward by the coalition parties in WA, and claiming that they do not care. Though I will happily defend his right to hold an opinion with which I cannot agree, it must be shown that his argument is flawed in many ways and displays a blatant disregard for the views of anyone who opposes the project. 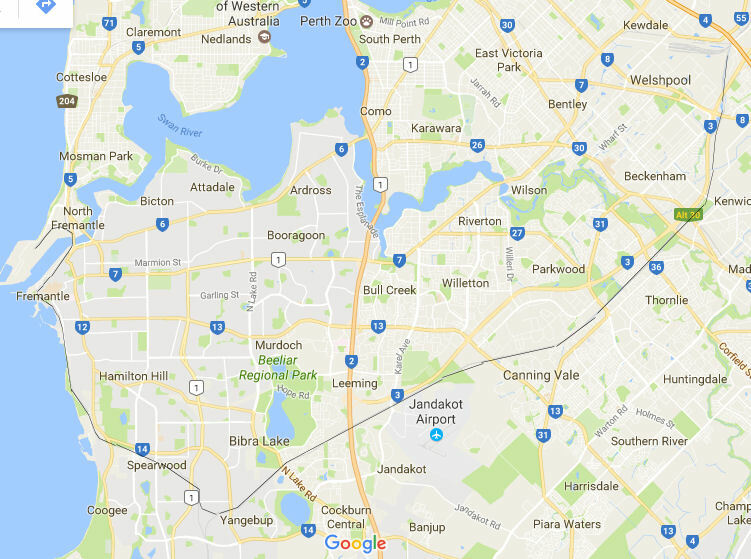 The Perth Freight Link, as proposed by the State coalition government, was planned to allow trucks to move between the Kewdale/Forrestfield freight terminals and Fremantle without using Leach Highway and the Kwinana Freeway. The project is made up of three separate stages, each of which will take years to complete, and will be dependent on State and Federal finances being in good enough shape to pay for each stage. Stage 1, otherwise known as Roe 8, would provide a road which is tolled for trucks but not for cars, taking those trucks off the freeway and Leach Highway east of Stock Road. On the face of it that is good: traffic densities on those roads should decrease. However, and this is a big negative factor for Roe 8, ignoring any case people might bring on environmental grounds, stage 1 will only transfer vehicles to Stock Road, which is not designed for the extra traffic load and is already heavily used. That will cause greater congestion because of the number of traffic lights, side streets and the fact that Stock Road only has two lanes in each direction, compared with three or more on the freeway and Leach Highway. Clearly the consequences of taking the new road only as far as Stock Road, in stage 1, have not been thought through. Without legislation to ban trucks from the Kwinana Freeway, and from Leach Highway between Stock Road and the freeway, it is likely that drivers will continue to use the route they have been taking, a) because it saves paying a toll, b) because it will avoid suburban streets already struggling with traffic, c) because there will be less interruption from traffic lights, d) because the drive to Stock Road will be much easier, and e) because drivers will not need to negotiate a left hand turn onto Leach Highway immediately before a significant rise on the way to Carrington Street. The map above, from the Main Roads web site, shows where traffic from Roe Highway (on the right) will be directed under the Roe 8 proposal, and where it will all be left to cope with narrower roads before turning onto Leach Highway. The government has spoken about Roe 8 going to a new interchange at Stock Road. It has not spoken openly about grade separations at various junctions and intersections along Stock Road. As the work on Stock Road has not been included in the budget for the project that’s additional expense which has been omitted. Stage 2, otherwise known as Roe 9, might be a tunnel from Stock Road, under housing in the Labor dominated suburbs of Hilton, Beaconsfield and White Gum Valley to resurface in time to link to the southern end of Stirling Highway. That would take trucks off Stock Road and off High Street/Leach Highway between Stirling Highway and Stock Road. About the only benefit is that the traffic would not be pushed onto other roads which are incapable of taking the load. Any other means of getting vehicles from the end of Roe 8 to the Stirling Bridge would be disastrous for home owners in several suburbs. Stage 2, if the tunnel proposal is applied, only serves to get traffic close to the Stirling Bridge, and doesn’t address the congestion on the leg from High Street to Tydeman Road and thus into the port for North Quay freight, or the leg from High Street to Victoria Quay. No planning of substance has been made public for those last stages. People might tolerate the inconvenience of increased congestion for a short time, but the coalition hasn’t even decided how it would like to transfer traffic from Stock Road to Stirling Highway, let alone cost it and budget for it. Assuming Roe 9, in some form, is built, then the expense of building the interchange at Stock Road will be substantially wasted. If we can believe the often unreliable Wikipedia, in the total absence of corroborating or contradicting evidence from Main Roads, the proposal is for a toll on vehicles heavier than a yet-to-be-specified weight from Muchea all the way to Fremantle. It is morally, and I suggest legally, unacceptable for a toll to be applied to an existing road which taxpayers have already funded. So far, we have Roe 8 moving traffic from roads designed for it to suburban roads not designed for it, and shifting the problem into another area instead of fixing it. We have only heard thoughts about how Roe 9 MIGHT get the traffic closer to Fremantle, so the congestion caused by Roe 8 will continue for years, and we have no solution to the congestion getting into Fremantle. This is the planning style of a government which made no provision for a downturn in the mining industries despite just about everyone else saying it was a case of “when” not “if”. Especially in the light of recent revelations from Treasury, we simply cannot afford to build Roe 8. The last eight years have seen State debt increase more than ten fold, and the coalition has the audacity to claim it is better at financial management that the Labor [sic] Party! The most striking failure of the Perth Freight Link, as being pushed by the coalition, is that there is already a means of getting all the freight travelling between the freight terminals at Kewdale and Forrestfield and both wharfs at Fremantle, and it has the added advantage that it also provides for freight going to the Kwinana area, in anticipation of more freight going through an “outer” harbour. That means is the existing, and regularly used freight train line, which runs roughly parallel to Roe Highway from Kewdale to the Kwinana Freeway, south of the lakes and then back through Spearwood to Fremantle. It would cost far less to upgrade the track and provide grade separations where necessary, than to build Roe 8 alone, there would be no environmental damage caused by the upgrade, and container traffic could be directed that way today. Using the train line will take all the affected trucks off the freeway, Leach Highway, High Street and Stirling Highway without affecting Stock Road, the Beeliar Wetlands, or anywhere else, and we don’t have to wait to start using it. The advantage of using the rail system is even better than that because the tracks extend all the way to Geraldton, so trucks heading to Kewdale from the north should be able to transfer their loads by Muchea and totally avoid Roe Highway. This map shows the existing, and still used, freight rail line (in black) from Kewdale to Fremantle taking a similar route to the port. Clearly this is a case of one political party wanting to get its own way and not being willing to take on board what its opponents are saying. To those who still want to push the coalition version of the Perth Freight Link I ask that you respect the opinions of those who are opposed to it and, in this case, accept that there is a better – in many ways – alternative to achieve your aim.